If you have bought an iPhone 7 Plus or iPhone 7 for AT&T, you’ll find the device does not come unlocked. 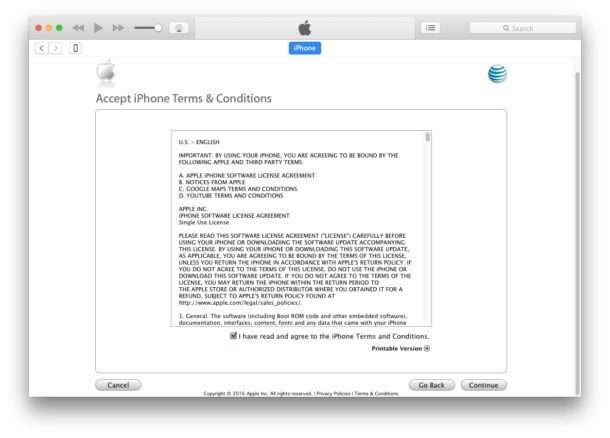 Fortunately, if you paid in full for the iPhone 7 you can easily unlock it with AT&T by using a simple iTunes process. The best time to attempt to unlock an iPhone on AT&T is when it is brand new and hasn’t been set up yet, since the unlock process is incorporated into the setup procedure. If you already setup the iPhone 7 and want to unlock it, you’ll need to restore it with iTunes, but otherwise the process is the same. To be clear, we are talking about cellular carrier unlocks here, not the lock screen. A carrier lock means the device is locked to use a specific carrier, say AT&T, T-Mobile, Verizon, etc, and can not use a different network even with a different SIM card from a different service. 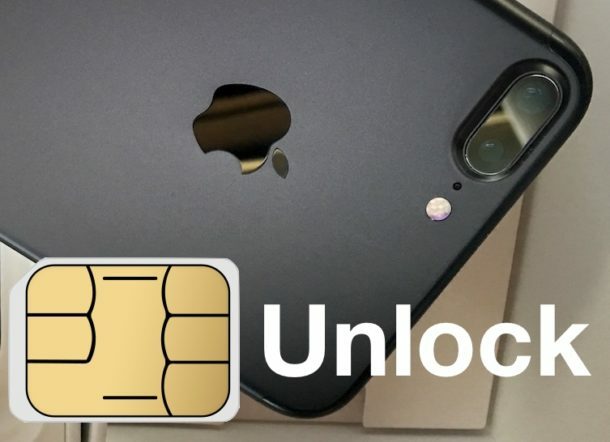 By unlocking the iPhone 7, you gain the ability to use a different mobile network assuming you have a compatible SIM card. This is great for travelers and it helps the resale value of an iPhone too. You must have paid full price for the iPhone 7 or iPhone 7 Plus to use this particular method to unlock your iPhone. If you did not pay in full, are on contract, or are you using an upgrade program, this will not work. The walkthrough here is for an AT&T model iPhone 7 that was bought from Apple for full price. That’s all there is to it. Now that the iPhone 7 or iPhone 7 Plus is unlocked it can be used with any GSM carrier with a compatible SIM card. I Already Setup The iPhone 7, How Do I Unlock It? You will need to backup the iPhone (to iCloud or iTunes), reset it, then connect to iTunes and set it up again. 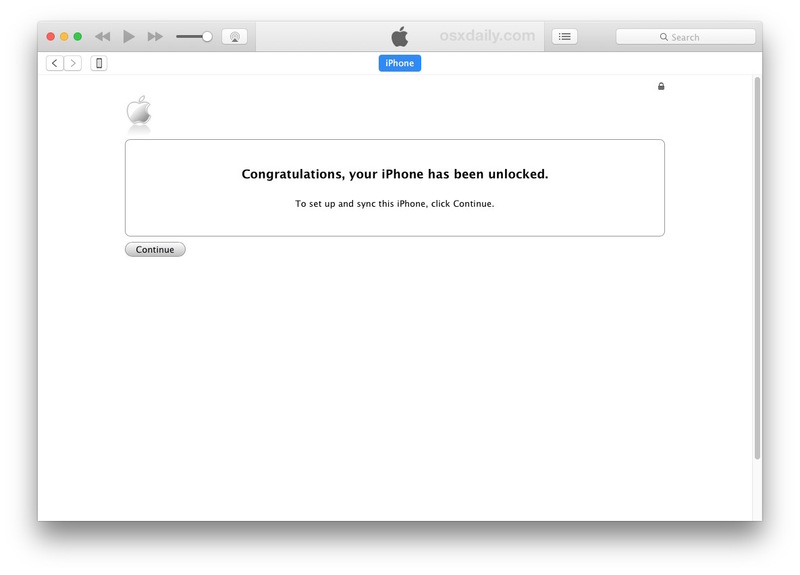 You must use iTunes to unlock the iPhone. My iPhone 7 Is Still Locked, How Do I Unlock It? If for some reason the above setup process did not work and you know for certain that you paid for the iPhone 7 or iPhone 7 Plus in full, you will want to contact AT&T. Optionally, you can use has a quick turnaround and you can often unlock an iPhone that is paid in full in under an hour. The Verizon iPhone 7 comes with an unlocked SIM card if paid in full. Apple usually sells a sim-free iPhone 7 too. I usually go for T-Mobile model until then. Actually, Verizon phones have always come unlocked, the company has never locked any devices to their network. Not even when they were CDMA only (I bought a verizon cdma only palm treo smartphone in 2008 and was able to activate it and use it with iusacell in Mexico). You do, however, have to pay full price unless you sign up for service on their network. By the way, I believe Verizon, as well as Sprint, will eventually have to switch to GSM and shut off their legacy CDMA networks. Iusacell (now AT&T) did that in Mexico on september 20th, 2016, leaving the US, Canada and China as the only countries still using cdma technology. That is a problem for users traveling outside those countries. This article is completely wrong. You just need to contact them and have the unlock approved. Apple is past the days of needing to reset the phone. Geez! CG, no actually the article is completely right. I just went through the unlock process with an iPhone 7 Plus, hence the article. When you pay in full from Apple for an AT&T iPhone, your iPhone is locked. By using the iTunes process above, it becomes unlocked as stated. Yeah, basically, if you paid full price you can go ahead and connect to itunes to unlock the device. In the past, you had to get on att.com/deviceunlock and request the unlock first, which att would grant right away, but now we can skip that step. You do not need to connect to iTunes to unlock. You do not need to do anything but put the new sim in and enter your Apple ID and password. Just left att with my brand new iPhone 7 plus. You do not have to reset the phone per the article. CG, the article does not say you need to reset the iPhone to unlock it, it says you need to set it up through iTunes. You have to reset it only if you skipped the iTunes setup and if it remains locked. My iPhone 7 Plus arrived from Apple locked to AT&T, just as AT&T specifies it will. To confirm this, the first thing I did was put in a T-Mobile SIM card and it did not work. 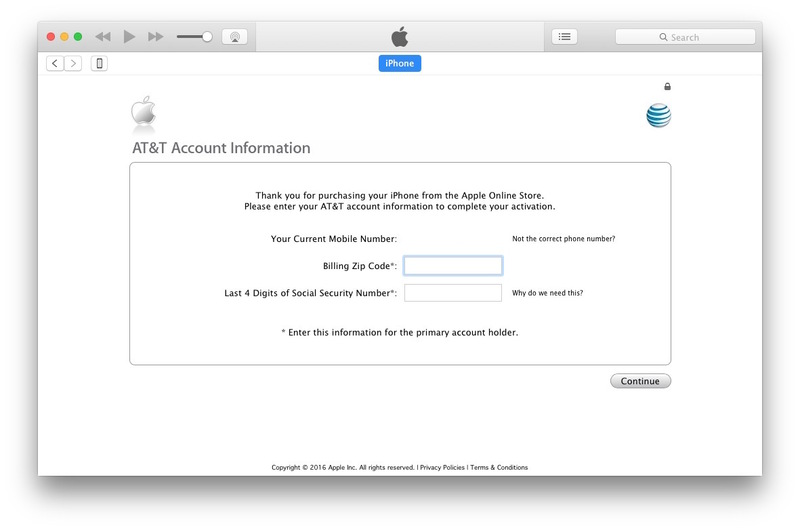 It had to authorize through the included AT&T SIM card (which is attached to an AT&T account and phone number, required to get past the authorization screen on AT&T models), and be setup through iTunes to unlock. That process, which is shown in the steps and screen shots above, also cancels any prior AT&T SIM card that was attached to the same AT&T number. Contrarily, I setup a T-Mobile iPhone 7 that did not require the authorization steps, it just worked immediately with any SIM card. Apple ID & password, restore from a backup or setup as new, everything worked. Additionally, with a friends AT&T iPhone 7 they set it up without iTunes but it remains locked to AT&T with the included AT&T SIM card. Maybe since you bought it from the AT&T store directly they unlocked it for you? I don’t know how to explain your experience but it differs from three different iPhone 7 models I have setup, and it contradicts what AT&T says. The good news is that all paid in full iPhone 7 models are able to be unlocked, even if they require iTunes and an account with the carrier it came from to unlock the iPhone. The Verizon, T-Mobile, and SIM-Free models apparently do not need to do this however, and can immediately accept any compatible SIM. No experience with the Sprint phone but it’s probably the same as the Verizon. The Apple store rep said to buy an AT&T version and it would work. Interesting enough I bought a Verizon 7+ phone, paid full price, put in my wife’s TELCEL chip and the phone is working fine. Not surprising. Verizon phones have always come unlocked. Verizon and Sprint going to have to switch to gsm soon. CDMA is becoming obsolete and it is in use only in the US, Canada and China. Even Mexico’s Iusacell network, the only such network there, is now gone. The company was acquired by AT&T in 2015 and its CDMA network was turned off on September 20, 2016, leaving gsm as the only type of network operating in the country regardless of the service provider. If you saw the unlock message then your iPhone is unlocked. You can test it by putting in a different carrier sim card. But what if you reset it again? Will it be locked? i assume it will. What are the advantages to unlocking a phone? I am on AT&T (which I do not like but they are here). I have a box of old iPhones which I assume are locked? I have a 6+ I use all the time, not planning on getting a 7. Why should I unlock, will it cause me other issues if I do? The primary reason to unlock an iPhone is if you intend on traveling abroad with it, or if you want to sell it. Aside from that unless you are going to change carriers from ATT to T-Mobile or similar there is little reason. My Motorola bag phone is unlocked. With the iPhone upgrade program you are essentially leasing or renting the phone. You turn it in every 12 months, or you keep it after you pay it off, then it could be unlocked when the terms are over and you have basically paid for it. If your carrier is AT&T the phone will be locked no matter how you buy it. If you paid full price you can unlock it right away. If you’re on monthly payments you will be able to unlock it when you finish paying it off (at which point you will probably be more interested in upgrading to a newer iphone rather than unlocking this one). Anybody know what the padlock icon is for? It is located on the photo on the top right. Just a question. To start the iTunes unlocking procedure you need to insert ATT sim card inside or you can connect iPhone without sim card? Tad did you get the answer to your question? How do I find out which carrier the full price iPhone 7 is locked to? I bought a full price iPhone 7 from bestbuy in USA and it is not working with any other sim out of the country. When I contacted Apple Support, they say the phone is carrier locked, but would not tell me which carrier. Whom do I need to contact in order to unlock the phone? What is the point of locking to a carrier if I paid full price? I bought an Iphone7 from Best Buy. I asked them unlocked, without contract and usable abroad. Unfortunately it did not work in my country, Turkey. Interestingly it is not connected to any carrier. Could you solved your problem? I brought iphone 7 from USA under T-mobile & i paid 864USD for 128Gb. but unfortunately i came to Bangladesh but no GSM is working here. as well as i dont activate this sim in USA. i badly need your help/suggestion to unlock this phone in Bangladesh pls. I have the same problem. I asked my friend from US to buy a 256gb iphone 7 plus and bring it to Thailand. I think you need a working ATT network to unlock the phone. Maybe I have to ask my friend to contact ATT to roam the attached ATT sim card so I can try the above unlock guide. I bought the iPhone full price from bestbuy – at&t unactivated. I live abroad and got it with no sim card, and am not able to unlock it through iTunes . At&t declines my request through their website. Yes you will need to contact AT&T or Apple. As the article says, if you buy an AT&T iPhone 7 then it is locked until you unlock it with AT&T. Annoying, but that is the case right now anyway. Hi guys, i am stuck with this exact same problem. Unfortunately a friend bought me a 7 from Best Buy in Houston and flew back here to Dubai. I cannot use this procedure because i have no AT&T sim neither a US phone number and SSN. What can i do ? I have the same problem.Could you solved it? If I have a brand new iPhone 7 that hasn’t been activated yet, but was purchased from at&t, and not paid in full.. Is there a way to unlock before activating? I just purchased iPhone 7+ full price it’s AT&T version I put in my Tmobile chip and it did not work how can I fix this? I also bought one from ATT, it worked and now mine is unlocked. How did your issue get resolved ? Did your issue resolved ? How ? I just purchased an iPhone 7 128GB in jet black under as a new customer of AT&T at Best Buy. I put 225 down on the phone and have 30 months of AT&T Next installments. I was in a rush to catch the last bus back and didn’t have the store rep activate the phone. Just for fun, I unboxed it and put in my TMobile SIM. It activated!! My phone is working under TMobile. I’m afraid to switch SIMs or try the AT&T one I have lest it somehow decide to lock. I’ll test it with a Verizon SIM and keep you updated but it appears my phone is factory unlocked. I don’t know if the associate grabbed it from the wrong pile or if the way the Best Buy system is setup for down payments it confused Apple and sets them as unlocked or if their gift card promo sets the phone as full price plus full price discount. (My receipt shows multiple lines of phone at full price with 100% rebate, can send a pic if you really wanna see it). The gift card promo for the iPhone 7 ends 12/31/16. As extra info, I did notice when I got a replacement 6Plus, the Apple genius brought out a certified refurb and when he turned it on it asked him to set a network carrier lock. Maybe my ‘new’ phone is a factory defective refurb that didn’t get set. I thought this may be useful to someone and they might figure it out. Or if anybody else wants to try their luck. I recently got an iPhone 7 plus under the at&t next payment plan. I’m still paying on my iPhone 6 Plus which I much prefer. I’ve been an at&t customer since 2005 and have. Ever failed to make a rather large payment monthly. If I continue to make agreed upon monthly payments, is there anyway it can be unlocked so I can sell it ? HELP!! If I’m on a “family” plan with my ex as the account holder, and he financed an iPhone 7 for me a few weeks ago, but now he is going to jail on the 23rd, how can I keep my phone and take it back to cricket where I used to have my service on a different phone that I don’t have anymore? He says the bill for my iPhone 7 will be good up to October. In the meantime, I researched how to unlock my iPhone 7 to use with any carrier and it already is factory unlocked to use anywhere, right out of the box. Will Verizon have a way to lock it if I take it to another carrier and it’s not paid off before or after he closes the account? Do I have to be the account holder to get it connected w Cricket? I have an AT&T iPhone 7 Plus. I want to switch to Verizon. If I pay off my IPhone and unlock it, will it work on Verizon’s network? Yes if your iPhone imei is clean, it will works but if you have unpaid bills, imei is blacklisted etc… you can still request to unlock it, after that your phone will work outside of USA only.